Grow Your Own Drugs and Grow Great Grub: Good garden books for beginner gardeners. Ever since I first visited the medicinal plant garden in Chicago I've wanted to create a garden where I could grow many herbs, annuals and perennials that are used in alternative medicines. The idea of being able to create all-natural remedies from ingredients I'd grow and harvest right in my own garden really appeals to the urban homesteader inside me. It is a shame that with every successive generation we move further and further away from growing pharmacies in our gardens like our ancestors did, heck our grandparents did. When I heard of the BBC Two documentary series, Grow Your Own Drugs , by ethnobotanist James Wong that has him trying natural remedies on members of the public, I wished it aired here in America. It hasn't been picked up or copied by American broadcasters but fortunately his book, Grow Your Own Drugs, is being published in America this month and I've got my hands on a copy of this international best-selling book. Grow Your Own Drugs isn't as nefarious as it sounds, it is all perfectly legal stuff and just teaches you how to use the various healing properties of many plants that you can grow in your own garden. This book is set up like a cook book with a list of ingredient and equipment (mortar and pestle, glass jars-simple things you probably already have) that you'll use often and should have on hand. Nothing seems terribly expensive and can be found at your local home goods store and health foods store. Grow Your Own Drugs teaches you how to make things like teas, creams, lotions, balms, gargles and cough syrups for common ailments from plants you can grow in your garden. It guides you through creating natural remedies for things like digestive disorders, skin complaints, aches & pains and "female problems." The 60+ recipes are easy to follow and most consist of only a handful of ingredients. If you don't have a lot of space for growing the plants that make up the ingredients you stick to growing the Top 10 medicinal herbs and source the others from places like your local farmers market, health food store or a regular grocery store. The last third of the book lists the Top 100 medicinal plants by fruit, vegetables, trees & shrubs, roots, herbs and flowers and leaves. The suggested plants section contains some information on growing but it mostly lists the beneficial properties of the plants and the growing conditions and times of years you could forage for them. With a few exceptions, the majority of these plants are plants you can find in your local garden center or grow from seed. Now that I know that lady's mantle can be made into a salve to stop bleeding in cuts and wounds or to ease itchy skin I'm going to have to stop letting the dogs pee on my plants. 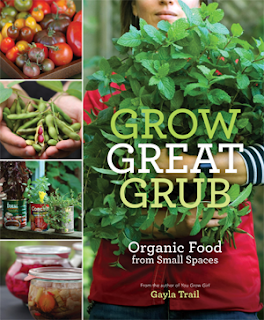 Grow Great Grub: Organic Food from Small Spaces is Gayla Trail's second book. It is a beautifully produced book on edible gardening, perhaps the most beautifully done book on the subject I've ever seen. Grow Great Grub is filled with information and tips on composting, seed starting, suggestions on which vegetables, herbs and edible flowers you should grow, what vegetables, herbs and flowers you should grow based on the site conditions of where you plan on vegetable gardening. There are even recipes to help you prepare dishes so that you use the crops your garden produces. For crafty gardeners or people who aren't afraid of small DIY gardening project Gayla included a few like the upside down tomato container. If you have ever been on the You Grow Girl garden blog or the gardening forum you've no doubt noticed Gayla's trademark graphic design style. The design of Grow Great Grub is very much like that of the garden blog and gardening forum. Curling up with her latest book feels like you're curling up with the You Grow Girl site, without your lap getting hot from the overheating laptop. Grow Great Grub is a beautiful vegetable gardening book filled with good gardening information and inspiring photos that makes vegetable gardening look stylish and affordable to younger gardeners and those of us without huge gardening budgets. There is some overlap in the plants you can grow for these two books. Buy both of them and you can create a sustainable-themed garden that you can use to feed and heal yourself. I was recently given these two books to review on my garden blog and wanted to share them with you. MBT, Remembering posts where you've mentioned the Atkins Medicinal Plant Garden and a conversation or two we've had about it, I'm not surprised this book appeals to you. I came across it at Amazon a couple of weeks ago. It's on my wish list there, and I've reserved it through my library's inter-library lending system - looking forward to reading it, and possibly adding it to my home library. Seems like a good one to have on hand as a reference. What I always find fascinating about herbs is that the quantity administered can change the results so drastically from helpful to hurtful. But, alas, my favorite drug, chocolate cannot be grown in my climate. I did try growing hops but it didn't work. Not that I would have made it into beer (too lazy) but I think I would have liked the plant itself. I'll have to look for "Grow Your Own Drugs." I've been doing a lot more reading lately about making your own teas, medicines, etc from the garden. The only problem is that I'm running out of room for everything I want to grow. Couldn't agree more about "Grow Great Grub." I have to do my review of it this weekend. Both those books look gorgeous. It's a bonus that they're useful. Great reviews, thanks for sharing! That's funny you remember those convos. I told you once that if I ever learned to write I'd like to publish a small book...this is the kind of book I meant. Oh well, James Wong did a pretty good job with this one. I find that interesting too. Then there is the fact that very similar plants could have different results. One can help you and the other can kill you, one mistake in ID by a grower, plant buyer or home gardener and the result could be disastrous. I've been hearing so much talk about hops lately that I wanted to try to grow some from seed this year. I don't want to make beer, it's just that everyone keeps asking me if I grow it that I figured I should. Can't wait to read what you think of Grow Great Grub. They certainly are beautiful books. Hope you get a chance to look at them in person if either one appeals to you. Grow your own drugs in intriguing. I can remember when I was about 12 or so, a friends Dad (who came here as a boy from Italy) sent us out in the yard to look for the leaf of a specific kind of weed. (type unrecalled in my old age) He had a carbunkle on his neck and said the leaf would help bring it to a head and bandaged it to his neck. Old ways from the old country. 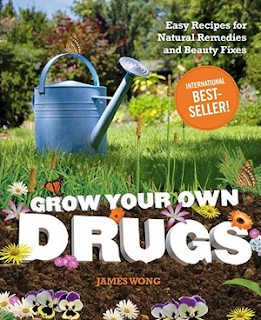 I'm always leery about plant books such as "Grow Your Own Drugs." Having spent most of my life around science, I always expect references and data to back up claims of "helps stop bleeding." I like to know why, not just that it does! But, then, even a lot of science is like that, especially when you look at agriculture--pesticides and even some fertilizers show good control/growth stimulation, and the scientists who developed the compounds don't necessarily know what it does to get its effect. But, in relation to books, I judge ones on the basis of whether they have scientific content or not--or at least give references. The whole "Scientists have shown" thing just rubs me the wrong way (sorry, Amy Stewart's "Wicked Plants"--which I've had for a really long time and haven't reviewed yet. But that's only because Mr. Subjunctive suggested it, and I didn't want to review it before he got around to it, but he hasn't yet, so oh well!). I have several memories of things like that too. At the time family members who visited from other countries seemed to backwards and their remedies so alien. It isn't that kind of book. It makes it pretty clear that there Western medicine is the way to go when you have a serious ailment. Although, it points out that many ingredients we find in Western medicine come from some of the folk remedies that are used by people who don't have Western medicine. But I see what you're saying and I agree about claims needing scientific proof. But for making things like your own lip balm you shouldn't need to consult a doctor or get a prescription. Oh, my leeriness is not entirely about whether something is hazardous or not. I just like to know, chemically, why things have a soothing effect or what-have-you when such claims are made. I think I recall someone telling me that insatiable question-asking about how things work is part of middle-child syndrome. I was really thinking the grow your own drugs books was going to be a little more, uhh... interesting. :) But this one looks great to! Thanks for sharing. Grow Your Own Drugs looks great. Added it to my wish list. Too bad the show isn't available in US I'd watch it. One of my favorite books like this is Rosemary Gladstar's Family Herbal. Here is a newer copy http://is.gd/8hc1X. She has a killer lotion recipe but lately I've only been making tea blends. I hope to make some fresh chamomile tea this year. Yum! Oh, ok. Now I get it. Well, too bad I'm not a scientist that can answer those questions. But it would be good info to have in these kinds of books. Ha! Now that would be something. Although, you can find that kind of drug growing info easily on the internet. Thanks for the book recommendation. I've added i to my list. I like the sound of both those books! I'm becoming more interested in herbal remedies, and using homemade household cleaners. I made my own kitchen cleaner out of white vinegar, water, glycerine and a few drops of lemon essential oil. Works great! Great ideas Mr. Brown Thumb - as always - thanks for the book references. I'm going to have to try that recipe for the kitchen cleaner. Shawna, Don't mention it. Thanks for stopping by. I wasn't really sure where to post this but have you checked out "Growing Tasty Tropical Plants In Any Home Anywhere" It is a great guide to growing tropical fruiting plants (including chocolate) in a container. There is nothing like eating pineapple, star fruit, or papaya freshly picked off of your own tree.